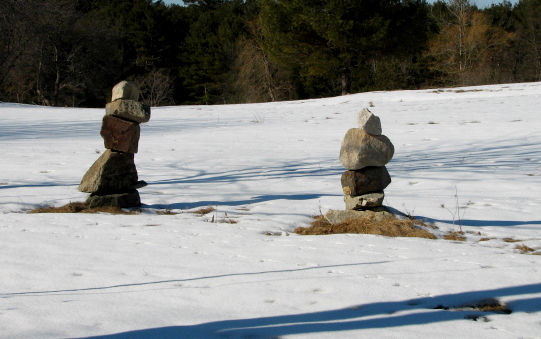 Northern New England is on pace to record one of its least snowy winters. Here in Portland, the average amount of snow by the end of January is 35 inches. Last year, we had about 56 inches of the white stuff. But so far this winter, we've had a hair over 20 inches - and with abnormally high temperatures, most of that has faded away. 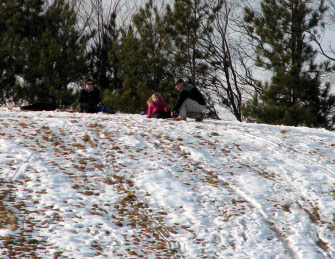 But that hasn't stopped everyone from doing the typical winter things. Who needs a lot of snow to build a snowman or two? 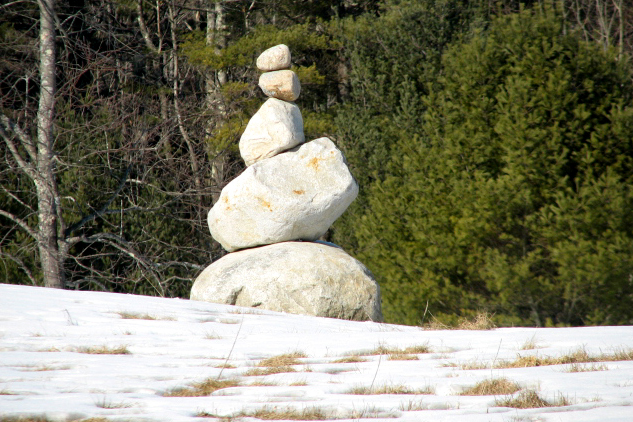 Thanks to the receding glaciers of the last Ice Age, Maine has rocks of every possible size. No snow? Big deal. Just stack up a few rocks and boulders. AND - these won't melt. 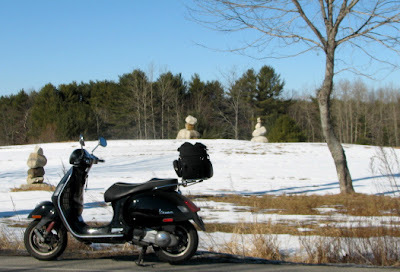 We'll have stone men all summer to remind us that warm weather in Maine is as fleeting as the hair on my rapidly balding head. 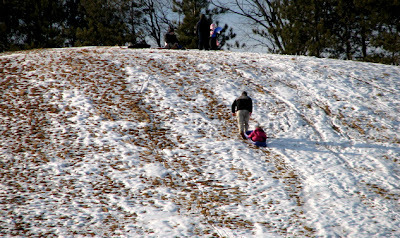 "O.K., sweetie - you sit on the sled and I'll give you a nice push, and you'll enjoy an exciting ride to the bottom of the hill!" "No thanks, Daddy - not enough snow. Running down has got to be more fun!" Maybe it was. She wore a huge smile when she reached the bottom. This time, Dad didn't pull her back up. Even fathers don't often get fooled twice. Love the sequence with the father & daughter. What fun that must of been to watch play out. I've been most fortunate lately - there's always something interesting happening when I ride around. If I were caged up in a car, I'd be missing too much real life! I love your new header photo! My county is all about rocks, too, and you will see smaller stacks of stones here and there. Those stacks look like they might be 5 feet and that's my height! Uff! Sweet and funny on the sledding story. Thank you, Martha. The photo was taken last summer at Higgin's Beach in Scarborough.